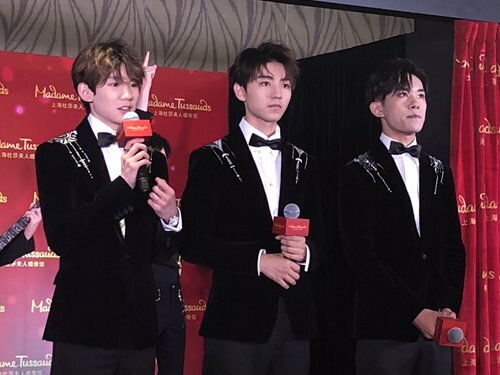 Popular boy group TFBoys showed up at Madame Tussauds Shanghai together with their "second selves" on Monday at a ceremony debuting the group's life-like wax figures. The three members, Karry Wang, Roy Wang and Jackson Yee, participated in the statues' unveiling on Monday morning, interacting and taking photos with their "twin brothers." As fans of the group celebrated the event online, posts related to the event received more than 110 million views within three hours. Pictures of the stars posing with the statues were quickly made into emojis that were shared on social media. Adding to the fervor around the event was the fact that Monday marked the fifth anniversary of the group's debut. At the ceremony, the stars promised fans that they will work harder to improve themselves and expressed their hopes that they and fans will continue to grow over the next five years. According to the group's representatives, the idols will hold a concert on August 24 in Beijing to celebrate the band's fifth birthday. TFBoys, also known as The Fighting Boys, has large fan base in China. They trio first captured the public's attention in 2013 with their cover of "Onion," a song by Taiwan band Mayday. The band made their official debut later that year while just coming into their adolescence, sparking widespread discussion about young idols in the mainland.